Тема WordPress от ThemeForest: Avisio, лучше всего подходит для портфолио или бизнес-сайта. Тема очень навороченная. Просто нет желания описывать все возможности. Настройка описана в прилагаемом файле документации. 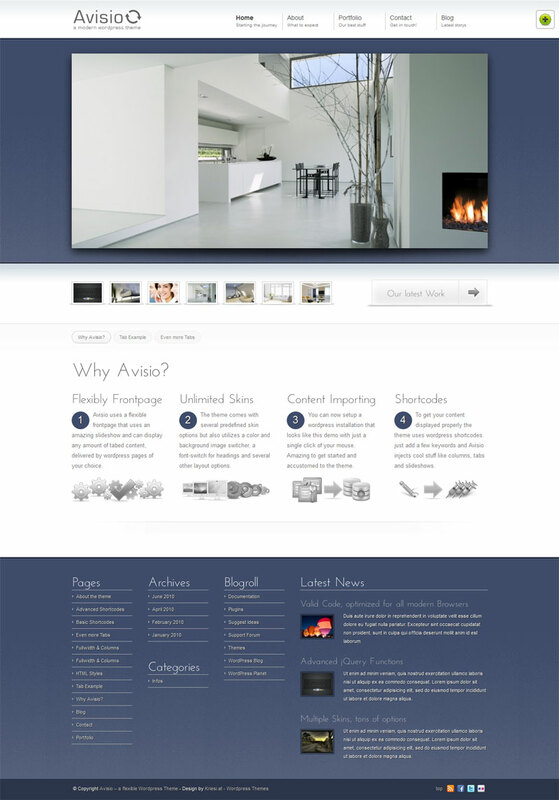 Avisio is a WordPress Theme that takes advantage with all the amazing new wordpress 3 features and is best suited for Portfolio and Business Websites. It has the ability to create unique skins right from your backend without the need to edit anything within your css files whith just a few mouse clicks and also offers the option to install content automatically when setting up the theme, so it will look like my theme preview! That makes it super easy to customize everything, since you can take a look first how its done at the dummy posts and pages. Style switching with color picker and multiple layout and font options.